Montreuil, 26 November 2012. A few days before the "Game Connection Europe", French software publisher Anuman Interactive has announced a deal with author Benoit Sokal and confirmed that the game "Syberia III" (to be marketed under the Microïds label) will be created. More than three years after acquiring Microïds and few days after unveiling the future "Dracula: the Shadow of the Dragon", software publisher Anuman Interactive has announced a piece of news that video game enthusiasts have been eagerly awaiting: the "Syberia III" project is underway, with Benoit Sokal (who wrote the first two Syberia) and Elliot Grassiano (the founder of Microïds) heading it up. Benoit Sokal has just signed a deal with Anuman Interactive to write the script of "Syberia III" for 2013, while Elliot Grassiano (who founded Microïds in 1985 and made the company famous worldwide) will oversee, as Vice President of Microïds Unit, the development of new publications under the Microïds label. 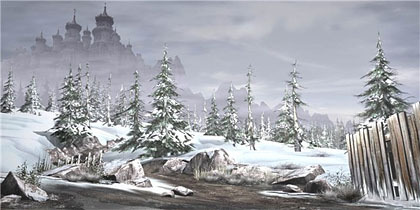 "Syberia III" is a multiplatform game scheduled for release in 2014-2015. Ооо, а я во второй как застряла в комнате с часами, так и псё. Хнык. *задумчиво* комната... с часами... не помню. Ага. Знач, мой интуитивный английский ещё работает. Спасибо! В ожидании 3-ей Сибири играюсь в Black Mirror. Первая часть очень вставляет, Scratches (Шорох) местами нервно курит в сторонке. Первая часть это нечто, казуальщиной либо отсутствием логики в действиях и не пахнет. Сюжет конечно, немного смазан к концу, зато жанр хоррор соблюден. Отличная бродилка, как по мне, хоть и немного попроще, чем Сибирь.